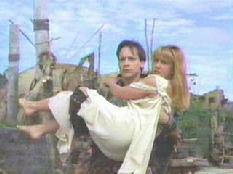 Joxer attempts to carry Gabrielle to safety, only to be overwhelmed by Xena. The producers of Xena: Warrior Princess took a big chance on a musical episode of their heroic series. There are many more bad musicals than good ones. The gamble paid off handsomely, as THE BITTER SUITE (58/312) both entertained me and advanced my understanding of the characters. I had been fully prepared to be disappointed, and, when I heard the score, I was glad for the preparation. Joseph LoDuca writes excellent instrumental music for XWP and has adapted other pieces nicely (consider his altered version of "There's No Business Like Show Business" in MEN IN PINK [H71/412]), but he doesn't do very well with original songs. Whether he intended it or not, the music in THE BITTER SUITE (58/312) came out as poor imitations of various composers. Admittedly, XWP does like to reference popular culture, but it's hard to parody music well. For a first attempt at a musical, however, it was not bad. The lyrics, by LoDuca, Pamela Phillips Oland and Dennis Spiegel, tended to be better than the music, which balanced things considerably. The cast, however, rose far above the material and made most of the songs quite enjoyable. In particular, the "Illusia" opening number, "Melt Into Me", the "Love Will Be Our Guide" duet and the "Forgive Me" finale were excellent. The cover of 'Reel Imagination: Classic Songs', a Michelle Nicastro CD available from Varese Sarabande (which also put out the HERC and XENA CDs). The best singing voice belonged, curiously enough, not to Lucy Lawless but to Michelle Nicastro, who dubbed in Renee O'Connor's songs. She interpreted the music flawlessly and sounded so much like O'Connor that I thought the latter was singing for herself. The lip-synching was perfect! Lawless was in good form as befits a Broadway star, but sounded somewhat jazzy for the material. This was most obvious in "My Heart Is Hurting Beyond Words". In the finale that quality worked better. Her vocal power and clarity were top notch. Kevin Smith is reportedly shy about his singing, but he has no reason to be. His breathy, seductive interpretation was exactly correct for Ares; it will be interesting to hear him in full voice. Ted Raimi delivered his best vocal performance of "Joxer the Mighty" to date. It takes a good singer to appear to sing badly, and Joxer isn't supposed to be competent at anything (except certain activities in bawdy houses) unless it really matters. Julie Moran of Entertainment Tonight (1981-) has a singing cameo in this episode. She has a good voice, but is apparently untrained. Her stage presence helped. As for the other singers, the woman dubbing for Hudson Leick was also extremely good, capturing Callisto's quirkiness. Between her and Leick I was quite willing to take a spin into Illusia. Willa O'Neill (Lila) was not as effective, but that may have been due to the sarcastic tone necessary to her lyrics: I don't think Poteidaia really would have wanted Hope around! The man singing "Hate" did well, considering what he had to work with. The chorus was good, though some of the solos were uneven. Broadway veteran Jeff Calhoun provided high-quality staging and choreography for the musical numbers, but I thought "Welcome Home, Xena (War)" looked too much like a combination of "Camelot" from Monty Python And The Holy Grail (Terry Gilliam and Terry Jones, 1974) and bad Busby Berkeley. He more than made up for it with the seductive "Melt Into Me" tango, the duets (always difficult to stage), and surprisingly, "Joxer the Mighty". Best of all was "Illusia", where Calhoun and the actors had to deal with a lot of computer-generated special effects they could not see while filming. Kudos also to director Oley Sassone; writers Steven L. Sears and Chris Manheim; Robert Field and Philip Tallman, who shared the editing duties for this complex production; and the set designers, crew and orchestra. This was a difficult piece of work to put together, but it flowed believably and almost seamlessly. One significant exception was "Welcome Home, Gabrielle (Peace)". This scene makes sense only from Xena's point of view, but Joxer leads Gabrielle directly into it. The writing and directing do not make it clear that this was Gabrielle's scene and that a split occurs when she goes through the door. It would have helped if Gabrielle had shown the scythe when she enters after "Melt Into Me (Let Go)". A tinier flaw occurs during the slow pan of Gabrielle in the purification hut; for speculation on this, see "Things to Look Out For" in the WHOOSH Episode Guide. Also, why is Gabrielle wearing her "bilious green sports bra" at the end? Shouldn't she be back in her white gown? Rob Tapert deserves special credit for the Tarot motif. I recognized several of the major arcana: The Fool, The High Priestess, The Hanged Man, The Wheel of Fortune, The Chariot, The Hermit and The Tower. It is no coincidence that the Tarot can be viewed as a journey of self-discovery, rebirth and renewal, the principal theme of THE BITTER SUITE (58/312). Xena is no Vanna White as she spins the Wheel. 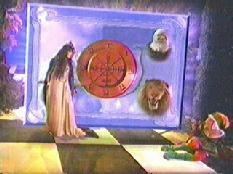 Xena spins the "Chakram of Fortune". Using Callisto as a guide was the perfect hook. Hudson Leick had a great time cavorting around while Xena fumed. The best production number of the lot overall, with lyrics that served to set the theme and make the whole episode believable. 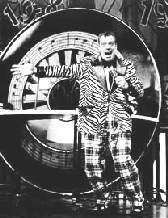 When the song reached its chorus, it dipped too far into a standard musical comedy opening, but was redeemed by the lyric "Gamble the worth of you/On the rebirth of you". Although the bit with Xena and the snake was nice, the comedy should have been toned down, especially since Joxer was set to be the other guide. Leick did not go over the comedic edge, fortunately. While I haven't tired of Joxer's song, and this version was clever, it would have been better to write something entirely original here. And what's with all the naked Gabrielles these days? Did some Joxer-phile find the scroll Aphrodite enchanted? Ted Raimi's physical comedy and Renee O'Connor's response fit the storyline exactly. It could have gotten out of hand all too easily. Aside from my dislike of the choreography, the piece sounded too much like bad Gilbert and Sullivan, perhaps Ruddigore . Even though Xena still seeks vengeance against Gabrielle at this stage, I can't believe that she would have been tempted to slide all the way back to her warlord past. At least Xena found the choice (and the production number) distasteful. The lyrics were poor, and there was too much comedy in the number. Something grimmer was called for. The weakest song of the bunch, with average staging. More bad Gilbert and Sullivan here, this time reminiscent of The Gondoliers . Gabrielle longs for home and stability, to be sure, but not stagnation! Add Lila's lines and you see why I feel the scene makes sense only from Xena's point of view. This choice was too easy to reject, made easier by (you guessed it) unnecessary comedy. At least there was not so much of it this time. The counterpoint at the end, a typical Sullivan device, worked very well despite the atrocious lyrics. "Warriors love war, war, war/Villagers love peace, peace, peace?" Please!! "Melt Into Me (Let Go)"
"My Heart Is Hurting Beyond Words"
Gabrielle expresses her hurt via song. Now we hear bad Sondheim, with SWEENEY TODD -like key changes and a weird melodic line. Then it degenerates into a shouting match. Still, we learn a lot about Xena and Gabrielle. Xena often acts like Gabrielle's big sister, as she did when Joxer first "died" in BEEN THERE, DONE THAT (48/302) The clincher? "If only you had done what you were told". Now Xena has lost both her children: her real son and her surrogate sister. Also, it finally hits us that Gabrielle has other reasons to feel betrayed besides their recent rift: "Xena, why is it never your fault"? This song worked for me, even if it seemed a little simplistic at times. Both women needed to understand that they must confront their hatred, Xena in particular, if only because she's had more people to hate. After the confrontation, our heroines can move on. "Love Will Be Our Guide"
 The melody is a reprise of "My Heart is Hurting Beyond Words", but it moves out of the minor key into a triumphant conclusion. It sounded better than the original song. Xena has Gabrielle back, and the latter concludes that Xena will have Solon back in some form. Water, which has healed the women physically, now returns to heal their spirits. AAUGHH! Bad Andrew Lloyd Webber! It even smacks of his pretentiousness. (As you might guess, I detest Lloyd Webber, except for an occasional song. The worst event of my theatrical life was the Tony Awards the year Cats was eligible). Xena has a final betrayal to settle before she can return to Gabrielle. She makes peace with her memory of Ming T'ien, and accepts Gabrielle's help. Xena and Gabrielle now forgive each other. With Solan's forgiveness (Xena betrayed him too, by not telling him she was his mother), the journey is over, the renewal complete, and both women return to the real world. The Illusia version of Joxer comes up with some clothing for the now-obligatorily-naked-in-every-episode Gabrielle. The nonmusical beginning may have led the series onto interesting paths. Ares is not done with Xena by a long shot. She may give him cause to regret his words on the mountaintop. Xena may not yet be finished learning how to control her anger. Gabrielle will have to confront the fact that Joxer has more than just a crush on her. After all, he was willing to take on Xena with his bare hands, knowing full well he might be killed. Even before that, Ephiny took him seriously. Once again, it is Joxer's concern for his friends that makes him less geeky and more heroic. And how did Solan get the power to create Illusia? "God is love", true, but this is extraordinary. Perhaps Zeus is setting Solan up in opposition to Hope, as he may need Xena and Gabrielle to oppose Dahak. An item to watch out for: Joxer dances with Gabrielle at the start of "Welcome Home, Gabrielle (Peace)". Hudson Leick says Ted Raimi is a good dancer, and this confirms it, even if all we see is a couple of underarm turns. 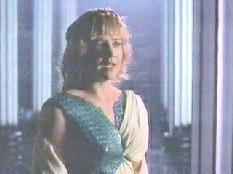 After releasing her hate and guilt, Xena is no longer burned by the waterfall of Illusia. One important thing needs to be said here. Although I have criticized a number of things in this episode (and, I hope, praised at least as many others), a musical episode of a television series cannot be judged in the same class as a Broadway musical. The latter has time to fix problems before the first performance and to test new concepts on the road. Television does not have that luxury. Nor does a Broadway musical usually need to adhere to a continuing storyline. The flaws in THE BITTER SUITE (58/312) were overcome by its successes. THE BITTER SUITE (58/312) was well done and worth watching. Original musical productions are all too rare these days on television, the recent production of Rodgers and Hammerstein's Cinderella (Robert Iscove, 1997) notwithstanding. While the genre really cannot be used very often on a drama, I would not mind seeing another musical XWP a season or two from now, perhaps a real comedy this time where Joxer tries to declare his love for Gabrielle. Thanks to Beth Gaynor for her commentary in the episode guide and other material she provided to Whoosh! 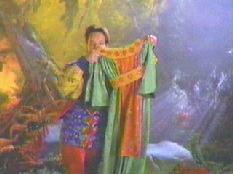 , Steven Sears for cleaning up some obscure points, and Tom Simpson for providing the songs on instant perusal at Tom's Xena Page. No composers' reputations were harmed in writing this review, though Joxerphobes, Andrew Lloyd Webber fans and Xenites who think Lucy Lawless can never be less than perfect may wish to harm the author. Phil D. Hernandez was born in the Bronx, New York in 1953 and has lived in Albuquerque, New Mexico since 1970. He is single, but currently has a girlfriend. Phil is studying electronics in order to begin a career change: he wants to get inside Intel so he can afford some "Intel Inside" (pun intended). An avowed Joxerphile who identifies with the character (like Ted Raimi, he used to be that way), Phil not only knows Joxer's song, but sings it regularly. Besides Xena: Warrior Princess , his favorite programs include Hill Street Blues , the four Star Trek series and Moonlighting . His musical credentials include more than 30 productions since 1984, mainly with the Albuquerque Civic Light Opera Association. His best-known performances were as Motel the Tailor in ACLOA's 1987 and 1995 productions of Fiddler On The Roof . Those who have attended Bubonicon may remember him as Dr. Rufus T. "Bonezo" Quackenbush in Walter Jon Williams' A Night At The Space Opera . He is also an accomplished ballroom dancer. Phil has written for The Cornell Daily Sun , the New Mexico Daily Lobo and The Europa Magazine . For several years he was also the principal author and editor of the Wargames West mail order catalog. Those of you used to Web publishing haven't lived until you have experienced an all-nighter under the influence of coffee and rubber cement fumes. Favorite Xena line not in the show: Phil (laughing at Hercules figures): "What next - a Xena figure"? Clerk: "Actually, there's two in every case. We're already sold out".